Clear files are like folders, save that they don’t fold. Most are just two sheets of plastic, stuck together on two sides (usually the bottom and the left). 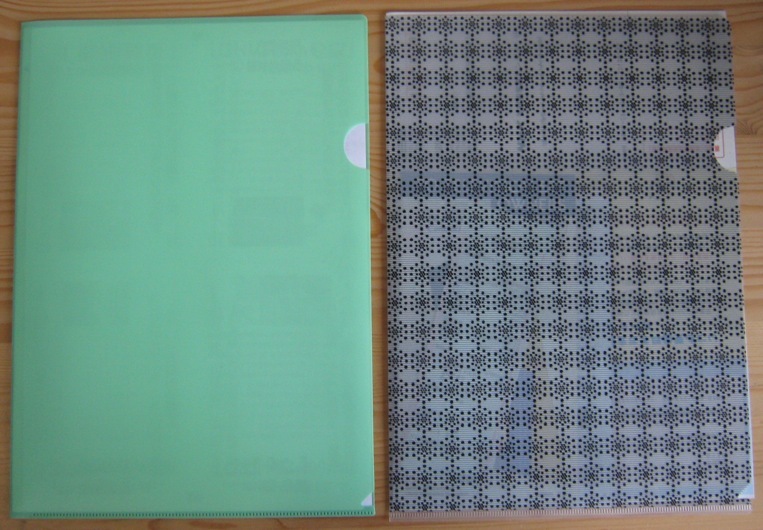 While I have seen two-pocket folders made out of plastic in Japan, I haven’t seen the paper type 2-pocket folder so ubiquitous in the States. It seems that clear files are by far the preferred way of keeping papers neat. Anyway, collecting clear files is a mini-hobby of mine. Some of these clear files are special freebies from events, others I just bought. But I can tell you when and were I got each one, so in that sense, they are a fond piece of my memories, just as all the photos I’ve taken. Unfortunately, I don’t have a scanner, so I photographed these trying to keep the camera perfectly parallel to the file, but it’s hard for me to do so the perspective is a bit skewed in some of them. Otou-san is the mascot of mobile provider SoftBank. I got this clear file as a gift when I signed up for my phone. I now use it to keep phone-related papers; not that there’s much since SoftBank only sends the first statement in paper form and then has customers view their statements online. As I started getting more papers to keep track of, I needed more folders. So I went to the 100 yen shop and bought some. You can usually get 5 plain ones for 100 yen. 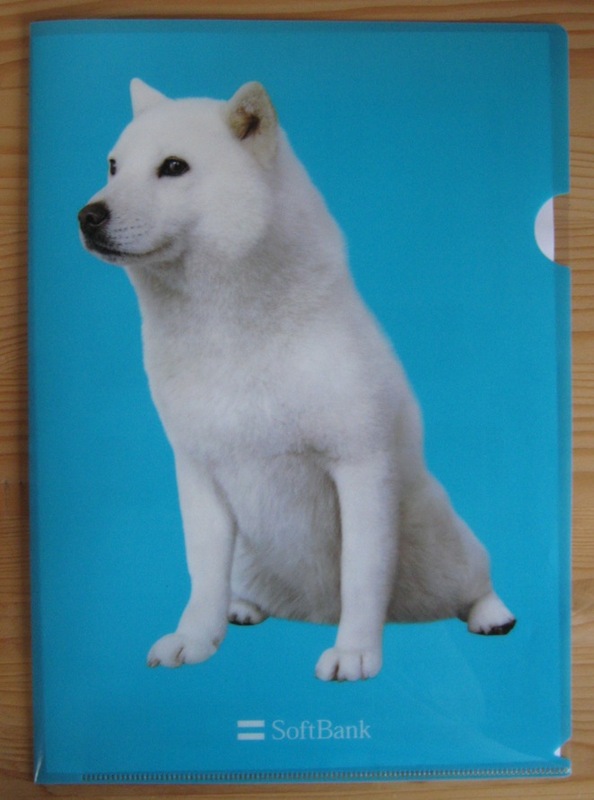 Fuujin: CLEAR FILE. Raijin: Ya know?! 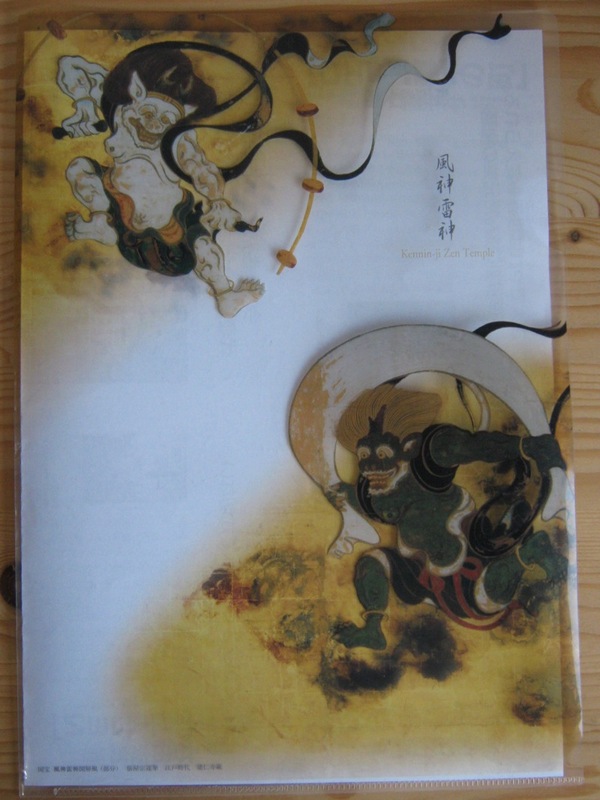 ^o^; Just kidding, this Fuujin and Raijin are the wind and thunder gods, not the characters from Final Fantasy VIII. I picked this up at a Tsutaya. 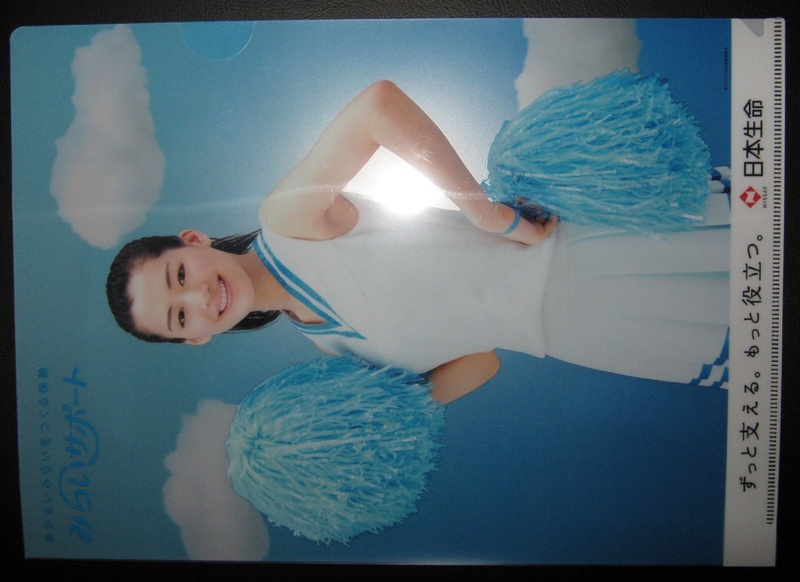 From this clear file on, I started keeping an eye out for other interesting clear files. I got these the same day. The one on the left features the artwork of Yoshitaka Amano of Final Fantasy fame. I got it for RSVPing online to an exhibit of his works that I went to with a friend. 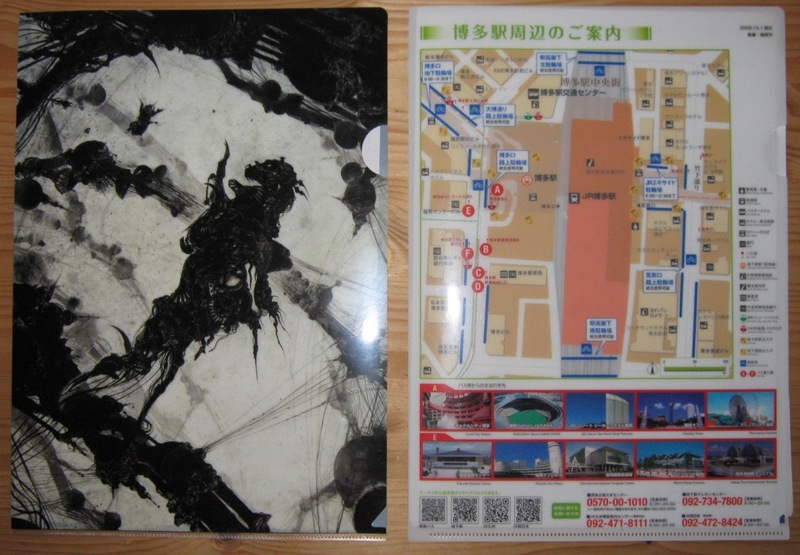 The file on the left is a freebie from the Japan Railways information booth in Hakata Station. As you can see, it has a map of the station, the surrounding area, and lists famous Fukuoka City places. Hakata-ben (“ben” meaning “dialect”) is the dominant dialect of Fukuoka Prefecture. At stationary store Incube I found several clear files with examples and definitions of words in Hakata-ben. The two I got for myself were 「あいらしか」(“airashika” meaning “cute”) and 「のぼせもん」(“nobosemon” meaning “an energetic person”). The file also gives a famous Fukuoka place in which you could appropriately use the given word. The red mask the little bear looking dude is wearing is also an item specific to this region. I don’t particularly like fairy tales, and especially not Disney’s adaptations. But, I do like the contrast of pink against black, and over all this clear file reminded me of Revolutionary Girl Utena, so I got it. Once upon a time, I was young and watched Pokémon. 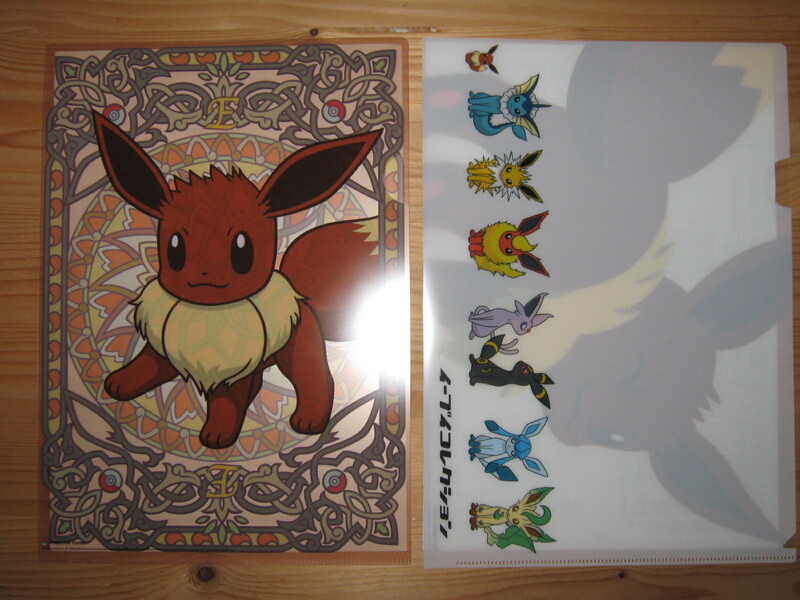 ^o^; I picked these two clear files up at the Pokémon Center in Tokyo. I didn’t mess up the numbering. 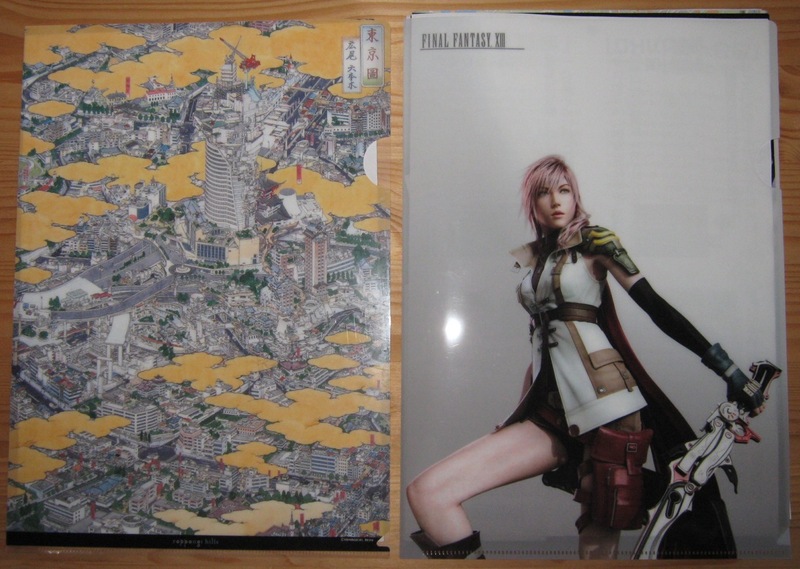 I got the clear file of FFXIII’s protagonist Lightning before I got the other one, but I wasn’t thinking about it when I took the photos. I put them together because I got both of these in Tokyo, just one day apart. The Lightning one I picked up at a Kotobukiya. The one on the left is of a piece by artist Yamaguchi Akira. From far away it looks like a traditional piece, but once you get closer, you see that the old-style drawing is of a very modern metropolis. I picked this clear file up at the Mori Arts Center in Roppongi. This photo makes it look more epic than it really is. I knew the file would reflect the flash, so I placed the flash strategically. ^o^ It’s actually kinda funny how I got this clear file. As you may or may not know, many Japanese high school teachers spend an unholy amount of time at school. Some are there probably for more hours than they are in their own homes. That’s not to say they have actual work to do during all that time (but that’s another matter) so it makes sense that many errands get taken care of from the shokuinshitsu. Besides the visits from the Yakult girl (known as Ya-cool in the States) selling yogurt, the most common solicitors are insurance salespeople. One day, some ladies from insurance company Nihon Seimei came up to me and asked if I’d take a little survey. I told them I could but that I didn’t need insurance. They said, “we’re giving away a clear file to people who fill out the survey, all you have to do is write your name.” It’s not that I particularly wanted the clear file, but I figured the quickest way to make them go away would be to just fill it out. So I write my name and answer the very first question (“Do you have a policy with Nihon Seimei?”) to sort of send a message (^_^;). I give it to them and without thinking, keep their pen, and they didn’t ask for it. For the curious, you can see the commercial at this link. If I were the guy’s girlfriend, I’d wonder why he has a cheerleader following him around. ^o^; Also, this in no way constitutes an endorsement of Nihon Seimei. I don’t use their services, so I don’t know if they’re any good. Now that I’m back home with my trusty HP printer/scanner/copier, I recently (July of 2016) gathered up all my clear files and scanned them. Because I’m insane. I noticed a few of the earlier ones were missing (such as the grey one and Mirai Support ones pictured above) and I don’t know what happened to them. Even so, I scanned a total of 67 clear files. Yikes. 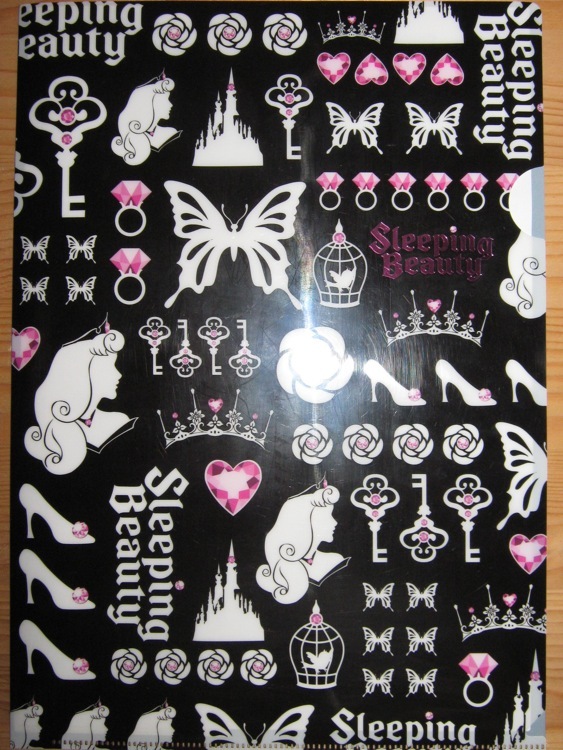 I no longer remember when I got each clear file exactly, although I do remember where I got most of them. And since I’ve already done the scanning, I figured I’d go ahead and add them here, little by little. Especially now that I know about WordPress’s gallery feature; I don’t have to struggle with the alignment anymore! I got this when I signed up for internet through KDDI. It’s about B5 size. Acquired August or September 2009. I think I got this one when the Daiichi Seimei ladies were going around asking people to perform some feat of strength, then they came back the next week and gave out prizes based on ranking. I think I was the second strongest woman. Acquired sometime between August 2009 and August 2011. One of the volunteer Japanese teachers at the class I used to go to was fond of gluing print-outs to clear clear files and giving her students handouts inside of them. Acquired in either 2012 or 2013. Another one in the Hakata dialect series. Acquired at some point when I lived in Fukuoka. Aoki is a clothing store. They must’ve been promoting themselves in late March or early April, as the caption on this reads “Congratulations on your suit debut!” That is, on putting an adult suit on for the first time. This is usually directed at young people either entering college or starting the job hunt. There was an exhibit at the Kyushu National museum in 2013 (IIRC) of Japanese pieces on loan from the Boston Museum of Art. 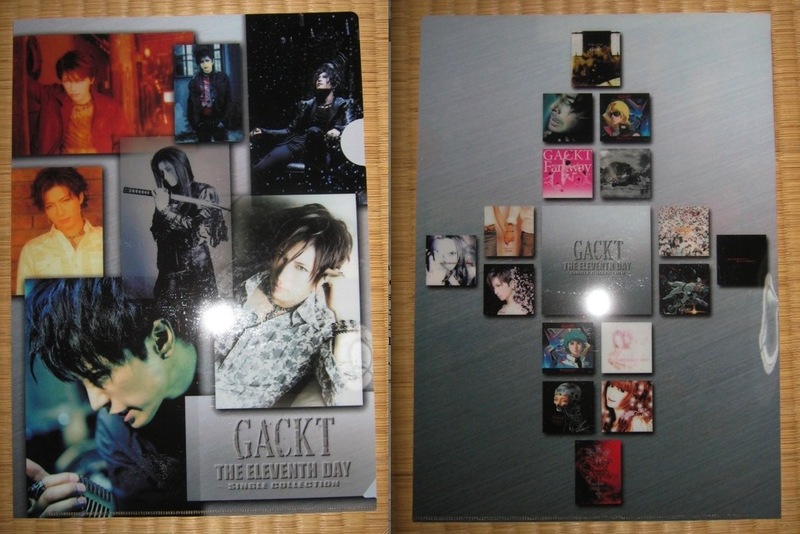 The back of the clear file with all the Buddhas on it. I left it at full size because I love this line drawing. Acquired 2013. Another clear file from the same exhibit at the Kyushu National Museum of Japanese works from the Boston Museum of Art. Acquired 2013.